I think you’ll agree with me when I say that Search Engine Optimization is not one of the reasons that you got into blogging. It’s not the most glamorous part of our job as bloggers, but it is necessary to our success. I see so many new bloggers that just publish material without any regard to the importance of SEO. You are a blogger and you pour your heart and soul into writing awesome blog posts that the world should adore. The world has no idea that you are publishing this awesome content. Unless you are using Search Engine Optimization. Today I am going to share with you my Top 10 SEO Tips for Bloggers so that you can begin to work your way up the google rankings and readers will be able to find your awesome content! SEO stands for search engine optimization and it is the process of implementing your blog posts with the proper factors so that the search engines will see your post as being highly relevant and will include your post on the first page of search results. I’m sure that you can see the importance of SEO, when it is shown in this light. Think back to the last time you Googled something looking for information. Did you go past the first page of results? If you are like most people, you probably didn’t go past the top 5 results. Top 5 in the Google results. And the only way that we are going to get there is by using SEO. This is probably the biggest mistake that I see new bloggers making. They don’t adequately focus on keyword research. Heck, some bloggers don’t do keyword research at all! And it is probably the most important aspect of blogging. If you are blogging about all of your favorite topics, but no one is searching for those topics. Who’s going to find your blog posts? I get it. When I started, I was the same way. I had a lot to say and it felt great to say it and get it published. That great feeling slowly wore off, as I could hear the wind blowing through my blog six months later because I was the only person there. My favorite keyword research tool is Long Tail Pro. Here is a great video tutorial on how to use Long Tail Pro to find profitable keywords. I realize that many of you want a free option for keyword research, so I am going to give you some tips for going the free route. Use the Google Keyword Planner to establish the monthly search volume for the main keywords that you want to target. There is a catch with the Google keyword planner. While it is a free tool to use, Google is going to make you jump through some hoops to use it. You are going to have to set up an Adwords account and actually create an ad. You can then use the free tool to find the keywords that you want to target. Make sure that you pause your ads, so that they do not run. Once you have done all that, Google allows you to use the Keyword Planner. You can simply add your main keyword and get suggestions for related keywords. In the screenshot below, you will see that I added “SEO Tips for Bloggers”. You can see that “SEO Tips for Bloggers” has an average monthly search volume of 70 searches, and the Keyword Planner returned 455 related keywords. Next, I will go through the 455 related keywords and try to find others that I can target with the same blog post. As you can see in the screenshot above, “Top 10 SEO Tips” has a monthly search volume of 110 searches. At this point, my idea is to write a blog post titled “Top 10 SEO Tips for Bloggers”. That way I can hopefully rank for “Top 10 SEO Tips” and for “SEO Tips for Bloggers”. However, we still don’t know how competitive these keywords are to rank. The Google Keyword Planner only gives an estimate of competition for advertisers, which has nothing to do with competition in the search engines. Jaaxy is a premium paid keyword research tool, but they have a free trial that gives you complete access for 30 searches to try it out. And the best part part is that they don’t require a credit card to try Jaaxy. So, go to the link above, and you simply put in your email and choose a password. Now I am going to put my two keywords into Jaaxy and see what it returns. In the screenshot above, I put my keyword, “SEO Tips for Bloggers” into Jaaxy. We are looking at the QSR, which stands for “Quoted Search Results” and it is the number of competing websites ranked in Google for this exact keyword. The lower the number, the easier the keyword is to rank. We are looking for anything under 300 and we have that here, so lets look at our second keyword. So you can see in the screenshot above that “Top 10 SEO Tips” has a QSR that is below 300 as well. I have found my target keywords for this post! Before I move on to number two of the Top 10 SEO Tips for Bloggers, I’d like to share one more free keyword research method that you can use for getting ideas for related keywords. It is called the Alphabet Soup Technique. You can see exactly how to use the Alphabet Soup Technique in this short video. As you begin to climb up through the Google rankings, people are going to see your post along with your meta description. The more compelling your meta description is, the more potential readers are going to click on it to read your post. That is what is known as “Click through rate” and it is a factor in how Google ranks your post. In other words, if your post is getting a lot of impressions in Google search and very few people are clicking through, that tells Google that your post is not as relevant as others for that search term. Here are a few tips for writing a quality meta description. Use your keyword in the meta description. Write your description with an active voice. Make sure to accurately describe your post. Keep your description between 150 and 160 words. One of the factors that the search engines use to determine rank is how long a reader stays engaged with your post. So you should be making every effort to post engaging content that will keep your reader focused. Use short paragraphs of no more than 3 or 4 sentences. Use black lettering on a white background. Use of headings to showcase parts of your post and make your points easy to find. Use Bold and Italics to draw the eye to important points. Google loves media rich posts and so do readers, so why not make the most of this fact and use lots of images and embed YouTube videos in your posts. You can use stock images, but it is better if you take your own. As you can see in this post, I have also used screenshots to illustrate my examples. Make sure to complete the Title and Alt tags for your images and use your keyword in at least one Alt tag. Try to embed at least one video from YouTube in each post. Find a video related to your post that is between 3 and 20 minutes long. Most readers will watch the video on your site, thereby increasing the time that they spend there, while you impress Google. Use a high quality infographic in each of your posts. You can find infographics at many sites including visual.ly , AwesomeInfographics.com and many others. It is perfectly acceptable to use these infographics in your post as long as you use the embed code and give attribution to the owner along with a link to their site. A high quality infographic can do wonders for reader engagement. Google loves long form content and so should you. You should try to create engaging posts that are at least 2000 words and more. Here are some interesting statistics from marketing expert Brandon Gaille . The Average Word Count of the Top Ranked Results on Google is 2416. A 2000 word post gets shared 63% more than a post that is less than 1000 words. Long Form Posts Improve the Rankings of Your Short Form Posts – Google values domains that consistently write long form posts more than those that do not. If you write at least one 2000+ word post every month, then all of your other shorter posts will also get a boost in their Google rankings. This is one of the often overlooked SEO tips for bloggers. Google loves it when you link to other authority sites. The biggest site that most bloggers use, and as a result is now overused, is wikipedia. There are many others that can have a positive effect on SEO. I try to find studies that I can link to from .edu sites. Also many of the news sites are seen as top authorities. It is also beneficial to link to authority sites in your own niche as I did above with Brandon Gaille’s site. Google also loves internal linking, which is linking from one post to another on your site and it is definitely a factor in SEO as evidenced by my friend Russ Lobo. You should strive to have at least 2 links in each post to other related posts on your blog. In my Experience, this is the most important of the Top 10 SEO Tips for Bloggers. Google loves high quality backlinks, and according to moz.com, backlinks are the most influential factors in the Google Algorithm. Here are my top 2 methods for generating high quality backlinks. Guest posting is a great way to generate backlinks to your blog and also a great way to generate traffic and introduce yourself to readers in your niche. Always go the extra mile to create high value content that readers will enjoy and engage with. Target authority blogs in your niche. Your goal when publishing a guest post should not be getting a link, but rather creating epic content for your host that will get you invited back for another guest post. Make it as easy as possible for your host to publish your content. Offer to format it for them in WordPress and provide high quality images and videos to accompany the post. Follow these tips and you may find yourself a guest posting machine. You should be spending 20% of your time creating content for your blog and 80% of your time promoting it! Guest posting is one of the best ways to promote your content! Infographics are rapidly climbing in popularity and have become a major source of backlinks for me. You can try and create infographics yourself, but one of the main criteria for getting a lot of backlinks is that they are very high quality. So I recommend having them created, which is what I do. Once you have your infographic, it is time to submit it to the many infographic submission sites out there today. There are many others that you can find with a Google search. Always provide a unique description of at least 300 words to accompany your submission. All of these sites are looking for unique content and will not publish your infographic if it comes with copied or duplicate content. You should also post your infographics on Pinterest, visual.ly and Reddit. Make sure that you use the word infographic in your title, because anyone looking for an infographic to share on their blog will usually use the word infographic in their search. One more way that you can use your infographic to build backlinks is to reach out to influencers in your niche and offer them your infographic with a high quality 500+ word article to go with it. This is similar to a guest post and if it is a high quality infographic, you can see some success with this method. As bloggers, we all just want to write and share and help others, but that will never happen if others can’t find our blogs. SEO is one of the necessary evils of blogging that have a tremendous effect on the reach and influence of your work. Put the Top 10 SEO Tips for bloggers to work today and begin to expand your reach and influence in the blogosphere! What better way to end this awesome post than with an infographic! I will tell you that I will be creating a Top 10 SEO Tips for Bloggers infographic, because this is the best that I could find! 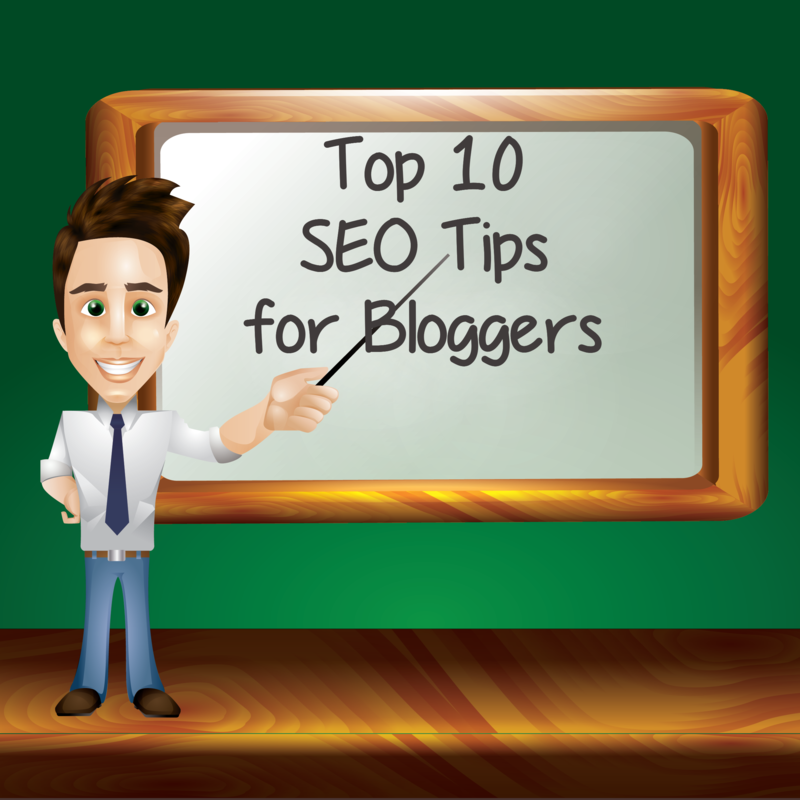 Please your comments on the Top 10 SEO Tips for Bloggers Below. Although, it was a little long post but informative. I heard about jaxxy for the first time, so will be checking that for sure. Thanks or the great share. Jaaxy is a great keyword research tool and it is absolutely free to use for 30 searches. Sign up for free for 30 searches and after you have used them, sign up again with a different email address. Nice informative list of basic SEO tips that everyone should follow. I would like to add some more, if you want to know that what keywords your competitors are using for a particular keyword then put their post URL in “Landing Page” section in Google adword keyword planner, this shows different keywords since Google adword shows same keywords to everyone. Else Semrush is a great tool, isn’t it? Using bulleted lists is definitely a good thing, most of the people are not aware but these bulleted lists can bring your site in the knowledge graph on Google which has a huge CTR. Thanks for sharing this knowledge with all of us. Great tip about using the keyword planner to find your competitors keywords! Also a great tip on the knowledge graph. I have just begun to implement schema into my website. Have you any experience with Schema? Thanks Karan, for adding awesome value to this post! I do care about Schema but have hardly done any work on it, since my theme provider is quite good and they have already implemented everything. I have done only one thing as far as I remember and that is putting Google plus rel=”publisher” tag of my profile on every post so that reviews are shown properly in SERPs with the ratings to increase CTR. And right now I am focusing on AMP. Now this comment contains a link so may be it would require Enstine’s approval, waiting for his approval now. I’m just beginning to understand Schema markup and rich snippets, but I think that it is good for our blogs and when I understand it further, I will create a comprehensive post about it to help others understand. I belive you skipped one major point about backlinks. When getting backlinks to your site, the anchor text must contain your keyword. That is not always the case. You must strive to build backlinks with a balanced ratio of anchor texts. Google does not like a backlink profile with all of the same anchors because it is unnatural. Think about it, if people were linking to you naturally, they would not all use the same anchor text. Some would use click here, some might use your name and some my use your URL. They definitely would not all use the same anchor. After going through this post, I cleared many of my concepts about the SEO, specially I like rather love the part of keyword research, its the point where most of us stuck always. Count my thanks for all this effort and writing a such detail post. In my humble opinion, keyword research is the most important part of being a successful blogger. Superb Information about SEO, really these Tips are very helpful and most beneficial for me. Basically, I visit on this blog daily basis and I have got more ideas on this blog. Today I learned new after reading this article. Thanks, A Lot for shared. I’m glad that you have learned from my post and Enstine’s blog is a great place to learn! Nice tips on improving your website’s visibility, however do not just limit your self to the above tips. There are lot more that we do not know but Google knows. Yes, these are only the top 10 SEO tips for bloggers. There are many more things that are important to the optimization of your blog. Google is constantly evolving and changing their algorithm and we must evolve and change as well! Thanks for the comment Gary! Awesome post! Every point you mentioned here are absolutely true. I knew almost all the tools but Jaaxy Keyword Research Tool is new for me. You should check out Jaaxy. It is a good tool and free to use for 30 searches, which is quite a lot. Thanks for your valuable tips on SEO for beginners and bloggers. I really love honest advice, instead of copying and giving crap. One of the foremost on-site SEO thing is “keyword research”. This should be done with LSI keywords. You can find them at UberSuggest.org. The off-site SEO of link-building is not in our hands. But we can comment on other blogs. Luckily we may get a backlink. Finally, hope the Google giant ranks us. This is how I do it. Thanks for the awesome kind words! That is a great tip to use ubersuggest! Yes, there are only so many things that we can do and the rest is in Google’s hands! Amazing to read such a lot of information on the vast subject called SEO! It’s indeed a wonderful thing to know the things in an infographic form, as you said the best way to conclude such a long post!! Philip V Ariel recently posted…Why Do You Blog?? ?Some Serious Thoughts on Blog Writing. My goal in writing this post was to provide Enstine’s readers with real value that they can take away and put to good use. This is nice and wonderfully presented. I stumbled upon the aspect that talked about Inter Linking Our Contents. I don’t know of any plugins that do interlinking and while it may take some time to do it manually, you will end up with a better result. Thanks for the comment Lawrence! John, I have read a ton of posts about SEO and I never tire of them. Each author seems to always offer up a new tactic to use or a new idea to implement. I’ll admit that I never used to pay attention to my meta descriptions. But the Yoast SEO plugin has helped me re-define my outlook on these! I’ve been studying SEO ever since many of my posts have hit the first page of Google. I’ve experimented, too, with using some power words in my titles to boost my rankings. As a freelance writer for hire, it’s always good to have social proof of my rankings, too, because potential clients are more likely to hire me to help them create awesome content that ranks well! Great to see you here on Enstine’s blog! Yes, Yoast has definitely made basic SEO easier for us! As a freelance writer, I would expect that you would be in high demand including SEO in your clients projects. Thanks again Lorraine for the comment! You are welcome to Enstine’s blog to share what you know best on SEO. I will like to ask if the tips will work for blogger or its for wordpress only, because am using blogger platform though contemplating of switching to wordpress soon to take advantage of wordpress plug ins that blogger dont have. The tips will work for all blogs and websites on any platform. Thanks for the comment Tola! I have read that infographics are the way to go. They get more shares and their info is easily digestible. I have seen some software that helps you to make them. I would get it but it is one more piece of numerous software to learn, lol. Infographics have worked really well for me. I don’t have the expertise to create really high quality works, so I have them created. It is pretty expensive, but well worth it. I usually pay $200-$300 per infographic. Thanks for the comment Jeff! Thank you soo much for this great post and tips. I recently created my blog and your post help me alot. Not know About long tail pro but i know something about Google keyword planner. Good luck with your blog! Just follow others have had success and learn from them. The Google keyword planner is a good tool, but it has limitations. Karan has a great tip in his comment below on how to use the keyword planner to find your competitors keywords. Thanks a lot for this awesome blog on seo tips. I generally don’t give proper interest in keyword researching. Reading this article I am expectations have increased. I think this 10 tips will help me to progress. I hope that these tips will help you to improve your blogging. I like to have at least 4 links to other posts in each article, but if you read the post from Russel Lobo that I linked to in this post, he has had great success with links in his sidebar to other posts as well. Bloggers have the dream to do the best SEO for their blog. They should learn about the keyword search and embed the keywords in the URL. Adding the keywords in the heading and the subheadings is the best thing you can do. The meta description of your blog posts had the major influence on the SEO. Good to see you here on Enstine’s blog! Yes, you should also use your keyword in headings and subheadings. Most themes will use your title as the h1 heading, so as long as you use your keyword in the title, it will be in your h1 heading. You can then use it and related keywords in subheadings as fits naturally. Thanks again for the comment Ravi! Thanks so much for the comment my friend! I am happy that you found it valuable and implementing these tips into your blog will help your visitors to find you in the serach engines. Thanks for the cool comment! It is great to be able to share my post on Enstine’s blog and try to provide some value to his readers. So detailed post you wrote, my friend! I am mostly using Yoast SEO as I am not so good at SEO and Yoast is treating so well in filling most of the SEO things for me. And yes, keyword research is the first and foremost an important part which I often overlook. As I am learning through the bits of SEO from awhile, I will greatly maintain my focus towards the keyword researching process to align my content to attract the most traffic from search engines. Thank you for writing everything in good details! So good to see you here on Enstine’s blog! Karan shared an awesome tip for using the Google keyword planner to find your competitors keywords. You can see it below. Even I learned something from this post! Thanks for the comment Adeel! Well you have shared a splendid guide about top 10 SEO tips with the help of these tips bloggers can easily improve their search rankings. I have already try different well known keyword research tools like Long tail pro, SEMrush, Keyword Planner and many others. But never try Jaaxy before so, will be checking that for sure. Jaaxy works pretty well and the best part is that you can try it for free. John – This is really nice information put together in one single article. Some newbie who are looking to find information on SEO stuff don’t find a single resource that could help them understand this concept. This guide will help them. It is great for experienced people as well. I hope that many will find the information in this post useful! Loved the way you explained it John as many bloggers don’t explain properly and tell people that do Keyword research etc. but you have explained that how you can do this and that. I’m sure that if they follow these all then sky is their only limit. If you do proper keyword research and do proper link building then you can rank it properly on google first page. Thanks for sharing your knowledge buddy. It sound like you know you what you are doing my friend. Thanks for sharing these useful information. I want to ask you that “If I write many post with different long keywords and then put link back to the main post. Is that way effective to SEO ranking?” Hope to see your reply soon. Thanks again! Yes, that is definitely beneficial to SEO. There are many different ways to interlink your posts. One such way is called Silo architecture or Silo structure. You can google these to learn more. Even I love to use Long Tail Pro the perfect Keyword Research Tool. Should we invest in paid backlinks like links management or Fiverr? Long Tail Pro is my favorite as well! I wouldn’t buy backlinks, especially from Fiverr. You never know what you are getting and Google does not like paid backlinks. Creating epic, long form content that others will want to link to. Like “The Ultimate Guide to Anything”. Also, list posts that include content from influencers in your niche. I just published “100 Powerful Quotes from the World’s Top Internet Marketers” and the social shares and linking was incredible! Another great tool for high quality backlinks is infographics. I use these extensively and I’m currently putting together a case study on how I used an infographic to build links and rank on the first page of Google for a competitive keyword with more than 1000 monthly searches! Thanks for Enstine for introducing John to us. I call SEO the dismal science, but as you have ably demonstrated it does work. Even novices can use some of the simpler strategies listed. You mention the advantages of the long post. The only point I would make about that is there seems to be a counter opinion that suggests that shorter posts can work fine too. Although social media is now my #1 way to generate leads and sales, I recognise that some people prefer SEO and associated strategies to build their business. Kim Willis recently posted…Who Cares About Your Network Marketing Business? I am one of the “wierd “ones that enjoy SEO. It is true that you can have some success with shorter posts in certain niches, but Google has shown again and again that it likes longer posts, especially in competitive niches where long posts are the norm. I agree with you whole heartedly about Social Media. I almost included being active on social media in this post, but I was bound by my keyword of Top 10 SEO Tips for Bloggers. I struggled with including social media in the top 10 and maybe I should have. Very relevant and well written! I am glad that you found my post valuable. I have a little question concerning the image links. Can I make them unclickable? So the will not take the visitor to the link where the image is uploaded? Also, I am getting some traffic from some referral website that I don’t recognize and looks spammy and unethical. Is it okay or I might get penalized by google? What can I do against it? A great post! All the points you have mentioned are very useful! I will definitely implemented all of these while blogging! thanks for sharing. How are you today? Awesome post. I love all of your tips. Tips # 5 Blog engagement is very important for any website. I agree with you. We can do with it in many ways. We can create it with compelling content. Content that is well written with bunch of bullet points, important information, well formatted can change the environment. Thanks for sharing this. Thanks for adding value with your comment Taposh! SEO is definitely a great thing for blogger to learn and it’s definitely for bloggers to save their income to get more readers to their blog. Yes, SEO does not have to cost a lot of money. It is only an investment of time and skills. Definitely try Jaaxy. I think that you will like it and you will find it it valuable for your keyword research. Hi John and Enstine. Actually, SEO is the precise reason that I started blogging. I had existing websites and I wanted to improve the SEO by targeting additional keywords and creating internal links. A blog is perfect for that, so my blog was born. You have a great list. I want to propose one thing. I think everyone should remove “engaging content” from their SEO tips lists. It’s become rather cliche, and is so vague. I don’t think people start blogs to be completely boring. I think most people believe that their posts are one of the best things that have ever been written, otherwise they wouldn’t click the Publish button. Just my two cents. Ben recently posted…Do You Have to be an Expert in Network Marketing? I love SEO. I love the fact that it is constantly evolving and as a result, I have to constantly evolve and learn. That makes it exciting for me. As far as the term “post engaging content” goes, I agree that it has become somewhat cliche, but I still see lots of bloggers that are not posting engaging content! That is why I included it along with some tips for making the post easier to read. I believe that using more images and videos could also fall under the “engaging content” subject. Regardless of whether it is overused or not, there are many bloggers that still need to be reminded of these things. What tool would you say is the very best for keyword research? What about Keyword research for local keywords? I find it difficult to track keywords in my local cities as Google AdWords planner doesn’t seem to give accurate results, unless its a really big city like San Francisco or New York. What an EPIC post it is! These are all very interesting On page SEO tips we already following this advice and get positive points. If someone tries to start their blogging journey, then they should keep in mind all these tips. Thanks for sharing this great tutorial with the US. The bloggers that follow these tips are the ones that are succeeding because they are getting the organic traffic from Google. You won’t appreciate organic traffic until you weren’t able to post for few days and your traffic drop like after market. Social media traffic may be quick if you have the time or money, but seo just need dedication and with time you will get used to it. Search engine traffic are everlasting. Thanks for these amazing points. That’s the beauty of organic search traffic. It is there everyday if you take the time to build a proper foundation. Thanks for the comment Rasaq! It is confusing at times. Basically, this I think is the best way to explain it to us. SEO can be seen as simple from this post. You know what? I hate SEO. Everything about it. But the point is there is no way we can live without it on the internet. I rely mostly on Yoast after writing what I hear my audience ask for. I believe writing for them is SEO – It makes your content natural. And that’s what search engines love. You should always write for your readers and provide solutions to their problems. Thanks for the awesome content Francis! The list is indeed very informative. blog traffic is something that every newbie is looking for. In lack of traffic, we, bloggers are nothing. I mean not making anything at all. So, you helped them a lot. but the biggest thing is that, one has to implement all these techniques. Specially infographic sharing trick is best. I have used it before and would love to do more for my niche site. I agree with you that infographics are a great way to share visual data and also a great way to get backlinks to your blog. I started the site http://awesomeinfographics.com/ and I would love to publish your infographic! Just submit it to the site and I will get it published with a link back to your blog! I don’t know if you have faced this before but still want to ask. In visual.ly, I find out that somebody has a do-follow link with custom anchor text when they post a new infographic. This link is a part of “Publisher Name”, “Publisher URL”, “Author Name”, “Author URL”. However, when I try to post, fill up these details, it won’t show up like the others. I don’t know why that is. I am not a big fan of posting infographics there. I much prefer posting infographics at http://www.awesomeinfographics.com and http://www.marketinginfographics.org. those are two good ones that are also free. Hi John VanDerLaan, great article with more SEO information. Keywords is truly a great factor in ranking our articles but I have a question. I have noticed some articles with many words over (1800 words) use to rank high on search engines, so is it the keyword that makes article rank higher or the number of words??? It is a combination of using your keywords and creating high quality, long form content around your keywords that gets you ranked on the first page. Thanks for the comment Hadharm! Thank you for the information. Truly keyword are a must. How far apart do you need to put your keyword and about how many times can you use this key word in a post? If you are using WordPress, you can use one of the popular SEO plugins. I like Yoast SEO. I try to keep keyword density around 1% or less and make sure that you are using the keyword naturally. You can also use synonyms for the keyword and related keywords. The important thing here is that is natural. Google is putting more and more emphasis on writing for the reader and not for the spiders. Thanks for the awesome question Tom! Hi awesome tips.. after reading this article i gained extra knowledge about SEO. Mainly a the Top SEO Tips infographics is good… thanks for this informative article. Glad I could help you gain some extra knowledge! Infographics are a really good way to build backlinks that is underutilized today. There are some high quality infographic sites that I have mentioned that will publish your infographic for free giving you a high quality backlink to your article. Cool interview with Anil Agarwal! Thanks for the comment Sathish! Great post John VanDerLaan, This is very informative, to be sincere I don’t value SEO.. But this list of yours has let me know its uses, I will make sure I practice it, I want to rank first on google..
SEO is one of those necessary evils that we must practice in order to get organic traffic to our blogs. I rank first in Google for a number of keywords in different niches and it is the best feeling to get there, but it won’t happen without an SEO strategy! Thanks John for the tips. I like all the points. I feel using infographics in your blog will be very helpful both for gaining links and social share. Anyways Awesome Post. Keep hustling. You are absolutely right my friend. Infographics have been a huge factor for me in both getting links and social shares. Thanks for the awesome comment Himanshu! do you recommend any article or site for learning infographics?? This is an awesome article I found. Your writing skills are really appreciable. The article is very interesting and useful for everyone, great job! I think will surely good rankings in google if we regularly post unique and fresh content on our blogs. Impossible to talk about SEO techniques , not to mention black hat . However, the number of black hat SEO techniques are ones that you should know not to use, because inevitably result in punishment and poor positioning in search engines . I believe you delivered what you said! Awesome guest post, unique stuff! Loved the tools and the tips.This post is worth a lot for beginners with some amazing free tools.Thanks for introducing them! It was good when I read this article, I have omitted the Use Internal Linking in my website. I am very grateful because he gave me a lot of knowledge in SEO. Hope you have many articles or more. I was wondering on your site for comment on any post.This post is very important about on page seo.There you mentioned every step which is important for boost any blogger’s blog on the top. you describe top 10 seo tips for blogging. 1 is about keyword planner or keyword searching here you told how to use keyword and then told its importance. 2nd point is very informative that is use your key word in your post url. Its mean user will easily understand what about this post. thanks to share this unique post with us. Thanks for this detailed article, keyword research is a good idea before writing any blog post. I always use Google keyword planner and it works great for me. Thanks for detail post about seo tips, keywords research is great idea before write any post. I always do the same method as you write here. Actually these are some essential things that we should follow because without proper research we can not get result. we should write on those topic that people also search then we can get some result in search engine. Onpage techniques are also good and I am happy that I am using all these tips in onpage seo. Any way thanks John VanDerLaan for sharing such detail post with us. Thanks for sharing this awesome post on how I can use SEO to make my business blog rank higher. I have tried few tips recommended here and I must confess that they are real. Actually I just read your infographics post and I really enjoyed your case studies shared in that post. SO thought read this post as well. Well I really love keyword research as this is the back bone of every SEO and it is the main thing which helps in google ranking. Linking to high authority sites is key to get higher search engine ranking. I got many article at first page in Google. Thanks for this detailed and useful article that thought us search engine ranking factor. Great post SEO tips here! I actually just purchased LongTailPro a month ago and I changed the keyword in a couple of older posts. Just doing this made a big difference. I checked Google Analytics and one of the keywords I chose was the main driver for organic traffic. These tips can definitely help many bloggers get on the right foot as to building a successful blog. I never heard of Jaxxy but I’ll be sure to recommend it to those looking for a great free keyword search tool. Got to know about Jaaxy keyword research tool from this post. Will use it. Really nice crafted post, John. thanks sharing this post because many tips leaurn of blogger.and Google does not like a backlink profile with all of the same anchors because it is unnatural. and many hard working on high profile.new blogger for Great tip about using the keyword planner to find your competitors keywords! Thanks for the awesome share. These tips will definitely help everyone including pros to get better rank on the Google’s SERPs. As you told above that, proper keyword researching and link building are one of the best ways to rank any keyword on Google’s 1st page; I agreed with your this statement. Have a great week ahead brother. I am a newbie in this field and I’ve read your article. It really very helpful to me. There are some tips i don’t even know about that. keep sharing this kind of information. Thanks for this blog. I had learned more thinks about this blog. Thanks John. Keep on blogging.